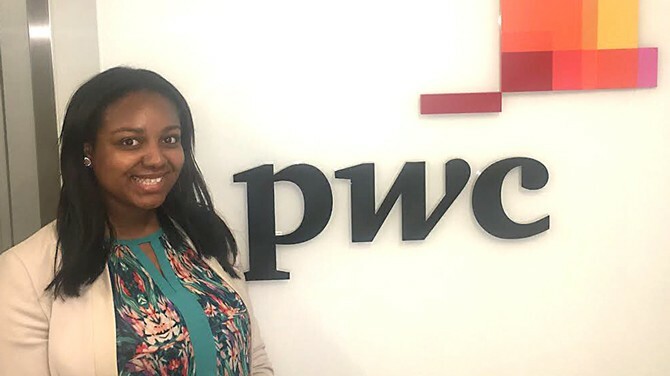 This is how Martisha Durant, an accounting major in the University of Delaware’s Alfred Lerner College of Business and Economics, described her internship with Big Four professional services firm PricewaterhouseCoopers this summer. PwC offered the internship to Durant after she participated in the PwC Freshman Connect program. After she participated in PwC Freshman Connect, PwC offered Durant a seven-week internship at the PwC office in Philadelphia. There, she worked in Internal Firm Services (IFS) as a Start intern. The Start internship is what PwC calls the first step in their internship experience. “I learned so much in so little time, and made friendships with people from all over the country as well,” Durant said. During the summer, Durant said that she learned about client relations and software information within the company as well as valuable skills that she can apply after the internship ends. “While I did not directly work on any engagements or clients, I was able to take a leap in my career by being hands-on with the company’s procedures and learning how the different lines of services in the Philadelphia office run,” Durant said. Durant also learned the importance of client relations, which is vital as accounting is a client-based career. She said that she was glad to be able to connect with so many mentors and coaches, which she feels enhanced her experience even more. Durant showed so much potential during her internship this past summer with PwC that they offered her another internship for next summer. “I cannot wait to be back at the firm and reunite with the professionals and interns that I spent this summer with,” Durant said. One of the internship’s biggest takeaways, Durant said, was the importance of connections and reaching out to others for guidance. She believes seizing opportunities is one of the most important aspects of success.